[Updated] Emergency services responded to Clearwater Beach tonight [August 20] after it was reported that a swimmer was in difficulty in the waters off the beach. The man — who bystanders said went in to retrieve a ball belonging to his grandchildren — appeared to be in difficulty when he was seen floating on his back with his head appearing to go below the water on occasion. Bystanders said children in the area noticed this and alerted adults who raised the alarm. A couple members of the public stripped down and jumped in the water, swimming out to assist the man. Bernews spoke with one of the men who jumped in to assist who explained that when the swimmer ran in to trouble he reverted to the position on his back to conserve energy. 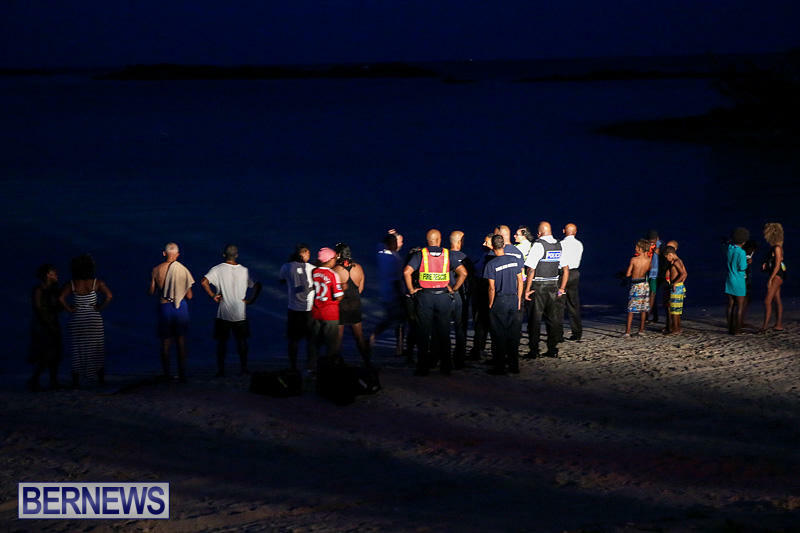 With the assistance of floating noodles and the rescuers, the man eventually made it back to shore safely where he was met by Bermuda Fire and Rescue personnel, Police, hospital staff and a watchful group of members of the public which included family members. The man who was able to walk out of the water was quickly embraced by family members and met with a cheer of relief from the crowd. 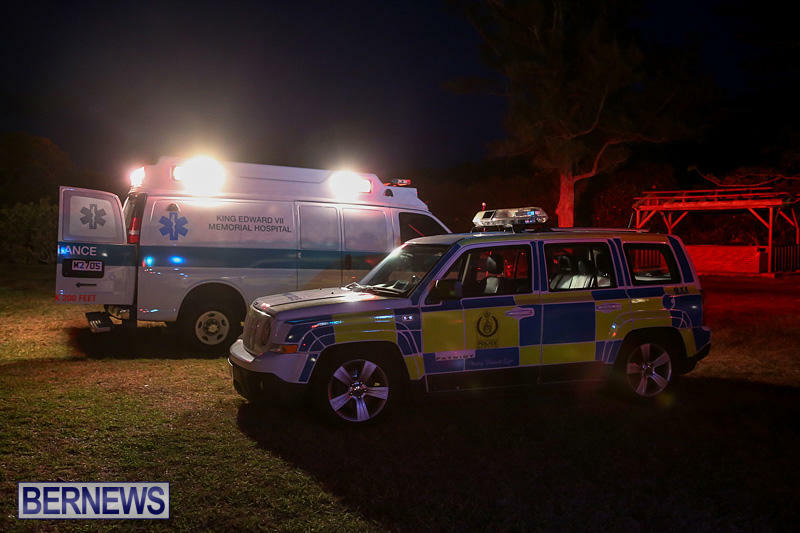 The man, who we understand is on the island visiting family, was taken to a nearby ambulance where after being evaluated and receiving care from medical staff left with family members. Update August 21, 12.55pm: The police confirmed our report, and also extended thanks to the people who assisted the 70-year-old visitor. The police statement is here. Whew, glad this didn’t end in tragedy. miracles do happen, thank God the children took notice and raised the alarm. It appears to have happened as the night approached which makes it more difficult, um glad he is alive and the family relieved. Allah-u-Akbar,,,,,G-D be pleased.Congratulations to the bystanders and other swimmers nearby and rescurers.We should always be on the lookout for other sea – bathers safety.Thank G-D the end was not tragic.Al-hamdullilah.Praise be to Almighty G-D Allah. Glad there is a happy ending. Keeping in mind…that floatational device can be replaced. Happy the man is safe and kudos to the children and rescuers. The people involved collectively made the rescue. Praising a deity as being the source of the rescue yet giving that same deity impunity as a 17 year old is killed in a bike crash is nonsensical. This type of sentiment is a yoke around Bermuda’s neck and is holding the world back from human progress. The beach ball was headed out to meet that fool from Florida. Seriously, the speed that a beachball can move across the water even in the slightest breeze is deceiving. Let it go.